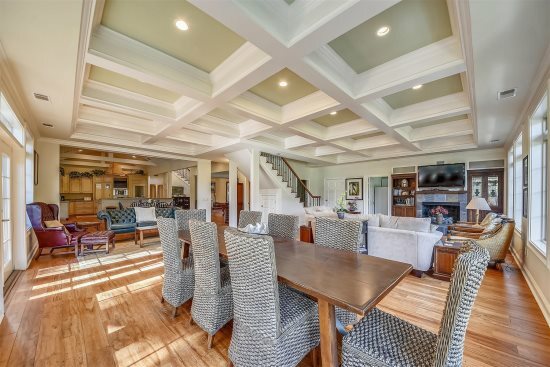 Elegance and sophistication awaits when you stay at this palatial 9 bedroom, 7.5 bathroom home in Sea Pines! Enter the main floor of the home and you'll be treated to majestic ocean views from a panorama of windows, illuminating a spacious, open living space. Here, a pair of armchairs and two extra wide overstuffed sofas rest beneath soaring vaulted ceilings and a towering hex-tiled fireplace to one side, 60" smart TV on an accent wall, an Alexa voice controlled music system with a 10 million song library. Walk around the accent wall and you’re in the spacious dining area that offers meal seating for 19 people. A large custom-carved oak dining table provides seating for 12, a table in the adjacent kitchen nook seats 5 and 2 bar stools along the kitchen counter completes the seating options. Passing over a marbled granite countertop to one side brings you into the gourmet-caliber stainless steel kitchen featuring a Sub-Zero refrigerator and Bosch oven, microwave, stove and 2 dishwashers. The kitchen is well stocked for your stay including espresso, Keurig, and drip coffee options, a crock pot, Panini maker, smoothie maker, pancake griddle and much more. The living room, dining room and kitchen all offer wide breathtaking views of the nearby beach & the Atlantic Ocean. 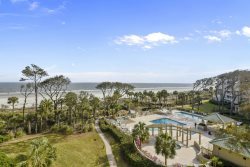 Exit through any of the sliding doors and you will find yourself on the marvelous elevated rear porch, offering al fresco dining for 8 plus 4 cushioned chairs and loungers for soaking in those beachfront views. On the south wing of the property, you’ll find two bedrooms each with a king bed, smart TV and en suite bath with marbled vanities and walk-in showers. The north wing hosts the luxurious master suite featuring a king bed, smart TV and sliders providing private access to a secluded section of the rear porch with expansive ocean views. The en suite bath features dual-basin vanities, walk-in closet, glass doored shower and spa-like garden tub set beneath vaulted ceilings and skylights. Also on the north wing is the 4th bedroom with 2 twin beds that can also be used as an office with a desk, printer, phone and smart TV to provide privacy and comfort for those who need to need to work a bit during your stay. Up a whimsical spiral staircase to the 3rd level you will find 2 bedrooms that offer elevated relaxation among the treetops visible through eye-level skylights. There's a king bedroom with built-in cushioned benches, coffee table, smart TV, plus a private en suite bath with a tub-shower combination. The 6th bedroom features two twin beds, smart TV and an en suite bath with walk-in shower. Moving to the lower level of the home you enter a large family/entertainment room that includes multiple sofas, a 60" smart TV, Polk surround sound stereo system, a 2nd Alexa voice controlled music system and a 4-person table for dining or playing games. Off to the right you will find a large wet bar with drink refrigerator, ice maker, microwave, dishwasher and a wide selection of glasses and supplies to serve up your favorite concoctions. You'll also find a pool table with a ping pong table top and an XBox One system with a selection of video games to enjoy. Adjacent to the family/entertainment room is the 7th bedroom which has a King bed, private en suite bath and smart TV. The 8th bedroom has a queen bed, a pair of twin beds and a smart TV while the 9th bedroom is furnished with a set of bunk beds. The 8th and 9th bedrooms share a hall bath that has a bathtub and separate shower stall. A powder room is centrally located for easy access from the pool or family room. Step through the wall of sliders and you’re standing amid a spacious pool deck offering plenty of outdoor seating situated around a massive 35' x 20' pool with spa that was resurfaced in March 2018. Seating options include a 4 person table, 2 person bistro table, 4 chaise loungers and an outdoor living room with wrap-around sofa with coffee table that seats 8. There is a patio stereo system to enjoy your favorite music while hanging out at the pool powered by a 3rd Alexa voice controlled music system. Instructions on how to use Alexa to play music, check the weather forecast and more is posted near the outdoor stereo controls. 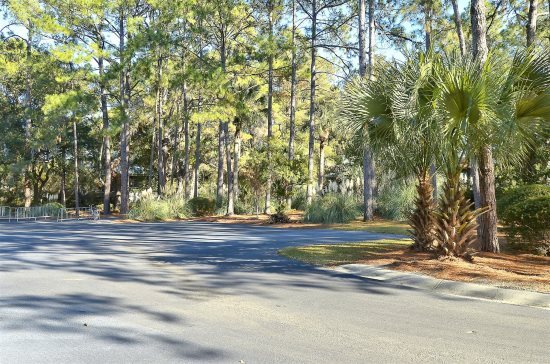 A bank of dunes and lush greenery provide privacy, while a wooden-planked pathway provides the ultimate luxury amenity: private beach access across a winding boardwalk. Partway on the walkway to the beach you will find a large 18' x 18' deck with 4 Adirondack chairs that are perfect to watch the sunrise over the ocean while sipping morning coffee, or watching the sunset over neighboring Daufuskie Island while enjoying a glass of wine or cigar. Our home includes a guest tennis membership at the South Beach Racquet Club (1/4 mile from our home). Membership provides 1 free hour per day plus 20% off additional court time, bike rentals and beach equipment rentals. Endless space to enjoy quiet moments as well as comfortable common areas to socialize with family or friends can be found in every nook of this magnificent & modern oceanfront home, with all the fun and excitement of resort living for you and your party to enjoy all for yourselves.